With little or no supervision, confined spaces, and a wide range of ages, which creates a power imbalance, school buses offer fertile ground for bullying. Indeed, up to 10 percent of bullying happens on the bus (U.S. Department of Education), and it can have the same negative impact as bullying that happens in the classroom or schoolyard. For many students, the school day begins on the bus. Students involved in bullying may arrive at school upset, fearful, or riled up, impacting the overall climate in their classrooms and in the school as a whole. While state anti-bullying laws vary as to whether the school has responsibility for bullying incidents that happen off school grounds, both students and schools can benefit from a safe, positive environment on the bus. •Establish clear anti-bullying policies that include rules about bus behavior. Review these rules with students and post them on the school bus. •Communicate behavioral expectations with parents and students. Send a letter to parents that reviews school bus policies and rules. Encourage parents to discuss appropriate bus behavior with their children and report any inappropriate behavior they hear about. •Hold regular meetings with students who ride the bus. These meetings can be used to establish bus rules, foster a sense of cohesion among the students, and build relationships. These types of meetings are a cornerstone of the Peaceful School Bus Program, which aims to decrease inappropriate behavior on buses. •Engage, train, and empower bus drivers. Often the only adult on board, school bus drivers are typically ill-equipped to address bullying on the bus and may not know the proper channels for reporting incidents. Simply engaging school bus drivers and other transportation officials about bullying prevention may be an important first step. The U.S. Department of Education’s Safe and Supportive Schools Technical Assistance Center and the National Association for Pupil Transportation provide free online materials to train bus drivers in how to recognize and address bullying on the bus. •Increase adult supervision on the bus. Whether a paid professional or an adult volunteer, an adult on board provides supervision and may improve student behavior. Monitors can provide incentives for good behavior, such as “bus bucks,” that can be redeemed for prizes (e.g., raffle tickets, water bottles, Frisbees®). Having the principal or a teacher greet the bus when it arrives at school also lets students know that they are being monitored. •Install video cameras on the bus. Cameras can both deter bullying behavior and provide details of incidents when they do occur. Simple changes to policy and practice can help improve the climate on school buses and decrease bullying behaviors. Preventing bullying on the bus can help assure that students come to school feeling safe and ready to learn. 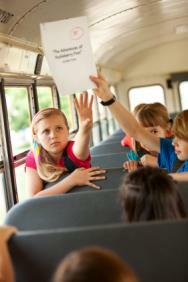 Is bullying on the bus an issue in your community? What steps has your community taken to respond to or prevent incidents of bullying on school buses? Please share your thoughts and comments below.